My lengthy track record and numerous testimonials certainly speak to my skills and expertise, but if you need more proof—or just aren’t sure exactly what an editor does or how I can help improve your content—this page is for you! For book-length projects (10,000 words or more), I offer a free sample edit on an excerpt from your book. This is the best way to get a sense of my approach to your writing and what it will look like when we’re done. Contact me if you’d like a free sample. For this website About page, I edited for typos and other errors and also provided feedback on ways the copy could be improved, expanded, and clarified. With contributions and edits by several people, this document was in decent shape but had some inconsistencies in spelling and punctuation and some awkward phrasing. Cleaning up these issues made the message more clear and helped the conference organizer put forward a more professional image. After the author expanded and improved the text based on my initial manuscript feedback, we moved on to copyediting, where I helped improve the flow of the text, cleaned up inconsistencies, and fixed errors in grammar and punctuation. This client came to me for feedback on an in-progress manuscript. I asked questions and offered suggestions throughout to guide her efforts to expand, improve, and clarify the text. After she completed the manuscript, I provided copyediting services as well. I'd love to hear more about your project and discuss how we can work together. 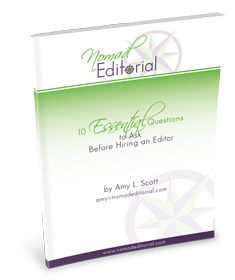 This free PDF walks you through all the important questions that will help you hire the best editor for you and your project. Success! Check your email to get your free guide. Since 2005, Nomad Editorial has offered editing services to help nonfiction writers finish their books. Founder Amy Scott has worked in publishing since 1999, and she now runs her businesses while traveling the world.